Snapchat Clone App/Script : How Creating a Multimedia Messaging App Like Snapchat Can Help You Earn Good Money? Have you ever thought of creating (Snapchat clone app) an app like Snapchat or Snow? If yes, this post is for you as we covered things you should keep in mind to develop successful photo editing app like Snapchat. Staying online for uninterrupted communication has become an essential part of our everyday lives. Apps like Snapchat, Whatsapp and Facebook messenger have exchanged the position of text messages and social media pages. It is much easier to chat without clicking a social network page. Building a Snapchat clone can be a great move to big it big in the world of chatting apps. Today we see the tons of popular multimedia messaging apps thriving in the tech world and they are powered every day with some new feature as an add on. Therefore, if you wish to create your own app like Snapchat, you have to carefully pick up the features which you need to add to make sure you have something interesting for your target audience. To build similar apps like Snapchat, it is required to learn about this mobile messaging application inside and out. In this blog, we’ll explore the ways to create an app like Snapchat along with its features. Snapchat was founded by Evan Spiegel and Bobby Murphy in 2011. It was the era when the three main giants – Facebook, Instagram, and Twitter commanded the digital space. The founders had launched something very similar to what was trending in those days, and hence there was a great risk involved. They wanted to include something that was not common and would interest their target audience. This is how they came up with the Snapchat filters. Today, Snapchat is available in 8 new languages. It supports Filipino, Gujarati, Hindi, Malay, Marathi, Punjabi, Vietnamese, and Urdu. Their innovative idea of self-destructing photos was much liked by people and it became a huge success. The new app succeeded to match the strengths of all three social network pioneers and created something completely unique. Snapchat is a multimedia messaging app that allows the fastest way to share photos, videos and live stories around the world. Users can take photos, shoot videos and add a caption, make filters or even drawings. The specific security mechanism is built in such a way that the photos and videos destroy automatically within a few seconds. The security feature is kept in mind as this messaging app is extensively used among teens. The app is kept updated from time to time with new features looking at the usage by young demographic. It is found that teenagers prefer visual communication to texting and because of that, Snapchat has become much popular among them. Snapchat’s growth from a conventional messenger into a private messaging space is really impressive. 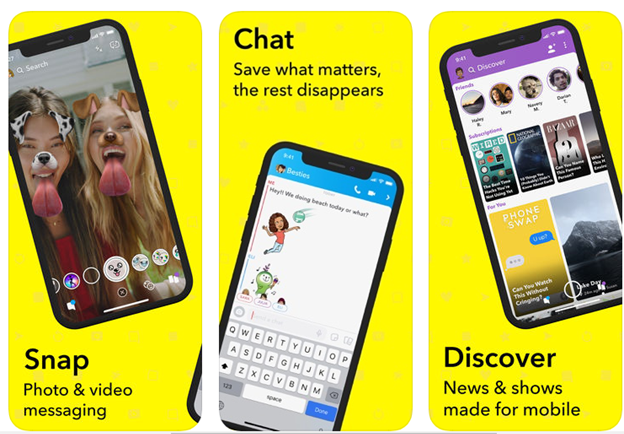 Furthermore, the Snapchat app appeared with some great new updates such as Discover and geofilters as a part of their monetization strategy. To develop apps like Snapchat, you need to consider its top features that are responsible for the app’s growing demand and popularity. If you are interested to build an app like Snapchat, you must learn what features it offers, so you’ll know what your Snapchat clone app should cover. Below are the Snapchat features. The most required feature you should consider while developing a Snapchat app is the ability to click and send pictures and videos that self-destruct in a few seconds. There are a variety of filters, text captions, and drawings available for photo/videos editing. Lenses are the most attractive Snapchat feature, after snap sharing of course, which is usually a goofy animation that users can overlay on the top of their photos. The Lenses feature is really a significant feature of this app. Geofilters are related to the originals. Users can overlay a design onto a picture or video which is shot in the Snapchat app, but what makes them different is that they are only accessible in different locations. The Snapchat app has introduced new ways to add your friends to your profile. They use personalized QR codes that users can easily scan with their camera to start following other friends. They are usually described as Snapcodes. They even have friendship profiles saved for each special friendships where the users can find the moments that they have saved together. Snapchat is not just a snap sharing app. It has a lot more than even the regular messaging. Snapchat could not overlook the use of stickers, so they included a lot of stickers within the updates. Snapchat allowed the users to make audio and video calls on an app in one of the updates. The main attraction towards this is the ability to stay on a call and send photos at the same time. Apart from this, users can create small audio and video clips which they call notes. 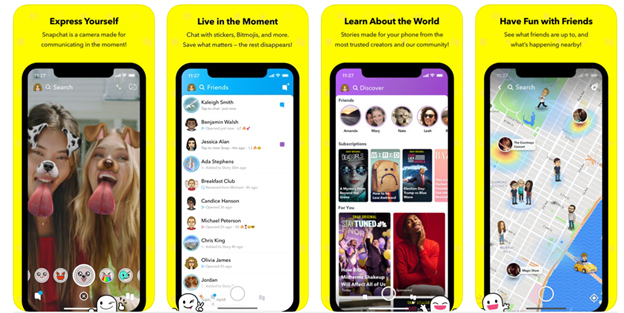 A story on the Snapchat app is a snap that is distributed to all followers which that they can see as many times as they would like for 24 hours. Snapchat users can see their viewer too. Snapchat also allowed its users to jump straight to their next friend’s Story by only swiping left in a story in one of the updates. And once a story completes, the next one from the list automatically starts. So, if you are on a research-phase on how to develop an app like Snapchat, then you must consider adding Stories to its feature list. Discover is a nice feature which keeps you up-to-date on the latest news, the sports, celebs and even your friend’s movement with Discover! You can watch your followers’ stories, publisher stories, events and much more that is happening around the world. A new feature to aid in-person meetups has been launched by Snapchat that gives the teens another shot at experiencing the Foursquare era. The app is testing an option to share a Bitmoji to tell what you are doing at a certain place. For example, using this Status option, users can show a little avatar of them playing video games or watching TV. These activities will be compiled in a private diary called Passport. This fixes the location issues in Snap Map and other check-in apps. Snapchat Status feature conveys what you are up to and what your intention is to let your friends know if you are free or busy with something else even if you are nearby. Click below to get free Snapchat clone app demo. If you are planning to create an app like Snapchat, you would like to know the cost of development for such an app. However, the cost of development for any application depends on two major factors- time required to build the app and the features to be included in the app. At Coruscate, we believe in welcoming innovations to the world. Imbibing the exact same features of Snapchat in your application will somehow not make your app rank in the app store and there are possibilities that it might even fail. However, once you have made up your mind and have a rough idea about the app like Snapchat that you wish to build, you can connect with us to get a free consultation to validate your idea. Our research team will guide to with the best possible and unique features that you can include in your Snapchat clone to make it stand out for your target audience. Our expert team of developers can design an out of the world app that can take your business to the absolute top of the competition. We have a record of 100% success in all our endeavors. We keep digging deep into the scope of each app that we design and come up with the best results for all our clients. Contact us to know more about how can we help you in generating more revenue and give new wings to your business.